"America is the most grandiose experiment the world has seen ... but, I am afraid, it is not going to be a success." -- Sigmund Freud (1909, after a visit to the U.S.). Whether Freud was wrong or right (and he was probably both), American literature of the early 20th Century showed both how well the experiment had succeeded and how much it had failed. 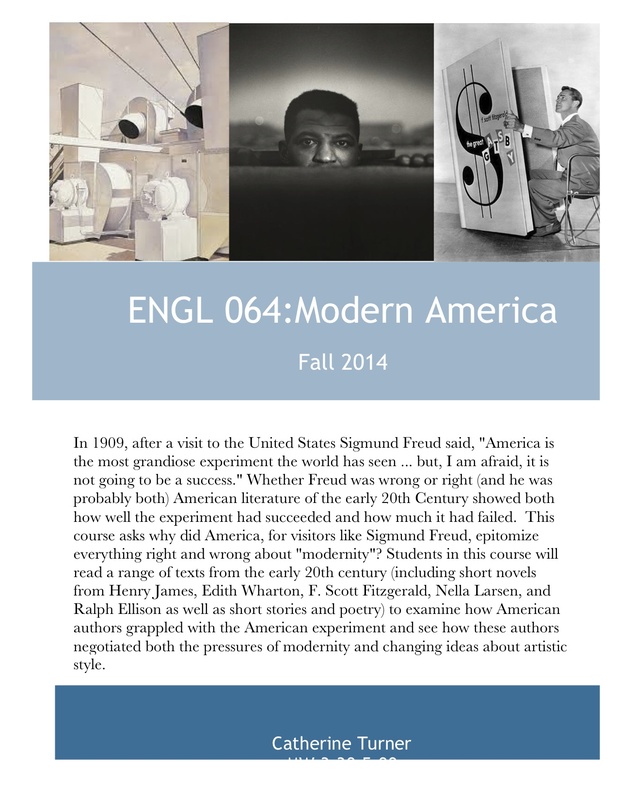 This course asks what did American literature become in the twentieth century? And why did America, for visitors like Sigmund Freud, epitomize everything right and wrong about "modernity"? The early 20th Century saw United States gain industrial might, develop a national consumer culture, become an increasingly modern nation and extend its international influence. These changes, in turn, altered American society and culture. To trace the ways in which changing literary and artistic styles reflected and influenced American society, this course will begin by reading texts by Henry James, Edith Wharton, Charles Chesnutt, Edgar Lee Masters and Mark Twain as a way to understand realism. Then we will trace the way that realism morphed into modernism by reading works by F. Scott Fitzgerald, Nella Larsen, T.S. Eliot, Nathaniel West, Langston Hughes, Wallace Stevens, Gertrude Stein, John O'Hara, and Ralph Ellison. Students will read short novels, stories and poetry and will write a series of short (1-2 page) papers that will develop into three mid-length (5-7 page) essays.